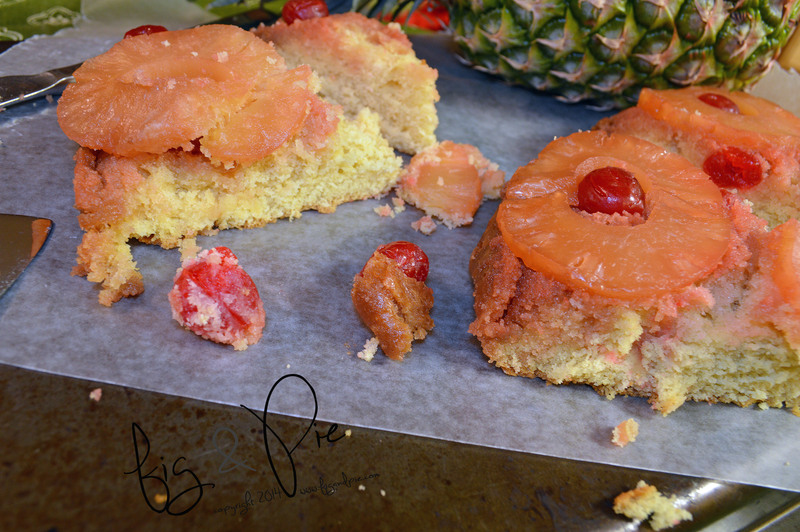 There is something wonderful about pineapple and maraschino cherries combined together – and it’s even better when it’s in cake form! The cake had the perfect amount of fluff and denseness; I might even use this recipe for other types of cakes (gotta get creative with summer fruit!). I used canned pineapple, but you could also use a fresh pineapple (I’m just horrible at cutting them and knew that I wouldn’t get fantastically shaped rings). 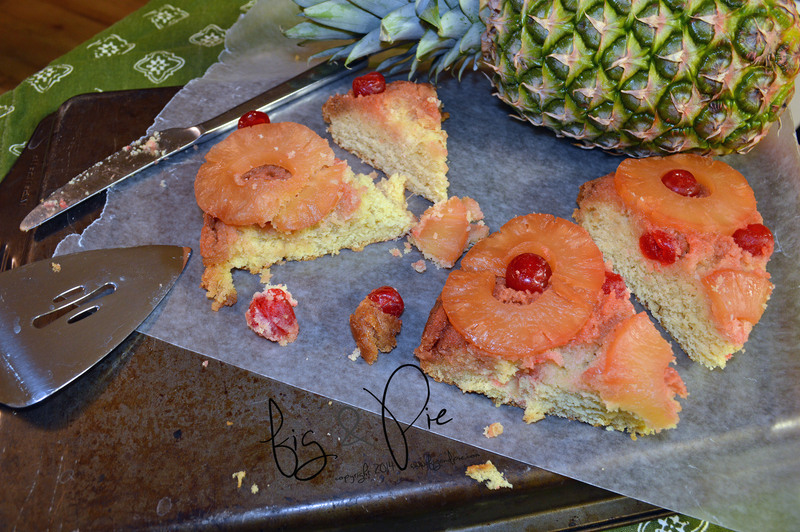 2) Drain and place the pineapple slices on a paper towel in one layer to absorb the excess juice. 3) Place the 3 tablespoons unsalted butter in a round 9″x2″ cake pan and put into the pre-heated oven until the butter is melted (about 5 minutes). After removing the pan from the oven, tilt the pan in all directions to coat all sides of the pan with butter. 4) Sprinkle the brown sugar evenly over the bottom of the pan. 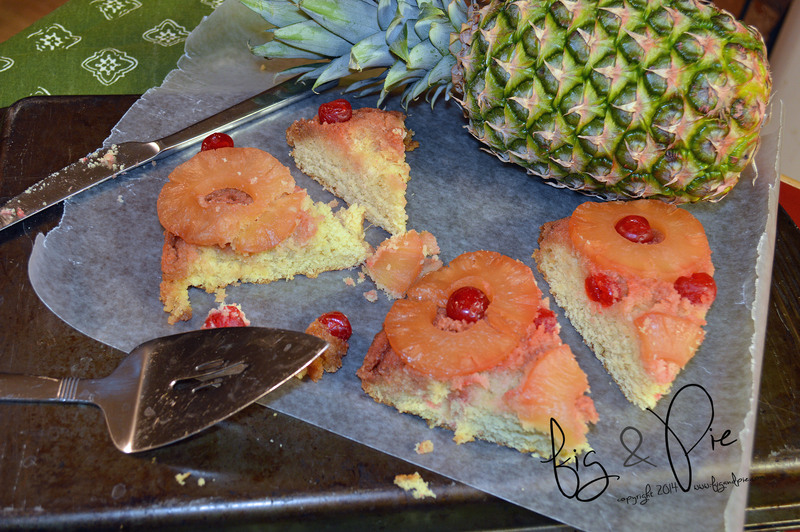 5) Place one pineapple ring in the center of the pan and arrange six more around it, then put the maraschino cherries in the center of each ring and in the spaces between them. 6) In a small bowl whisk together the eggs, 2 tablespoons of buttermilk and vanilla with a fork. 7) In a mixer bowl stir together the flour, sugar, baking powder, baking soda and salt. Add the 6 tablespoons of unsalted butter and 6 tablespoons of buttermilk. Beat on low speed just until the flour is moistened, then increase the speed to medium, or high if using a handheld mixer, and beat for exactly 1½ minutes (I’m not sure why it has to be exactly this amount of time, just do it). Add one-third of the egg mixture at a time, beating for exactly 20 seconds and scraping the bowl each time. 8) Pour the mixed batter over the fruit in the pan and spread evenly. 9) Bake until a toothpick inserted in the cake comes out clean, 35 to 40 minutes. Remove the cake from the oven and let cool for 2 to 3 minutes before removing from the pan. 10) Use a knife to make sure the cake is not stuck to the sides of the pan, then place your serving platter on top of the pan. Turn the cake onto the plate and remove the pan. 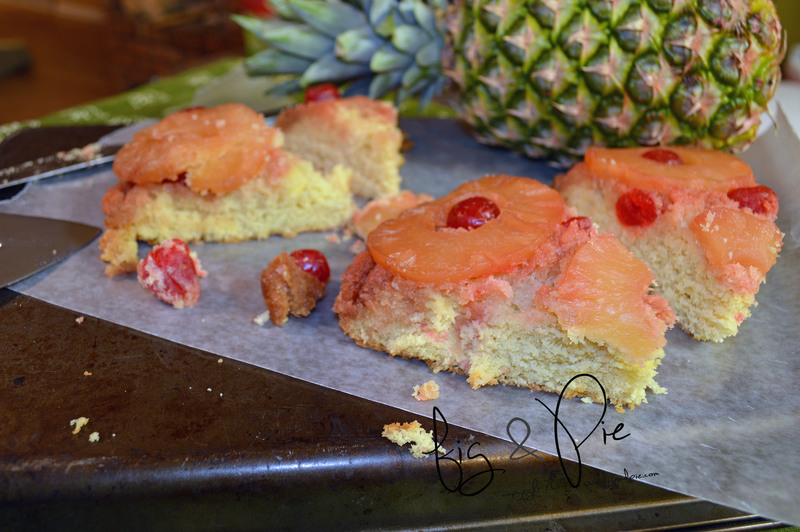 If any pineapple or cherry pieces are move simply push them back into place. Serve warm or cool.